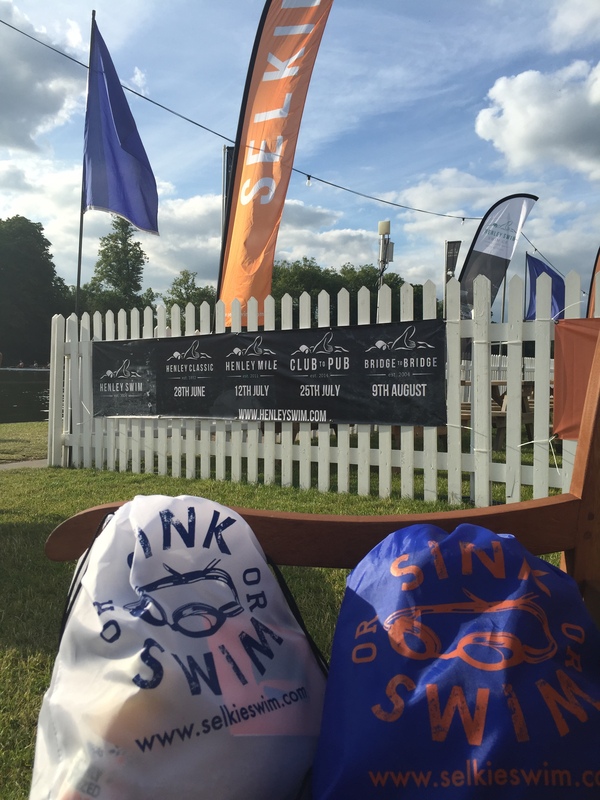 This was my first organised swim only event since school swimming galas, I was attracted by the history and location. 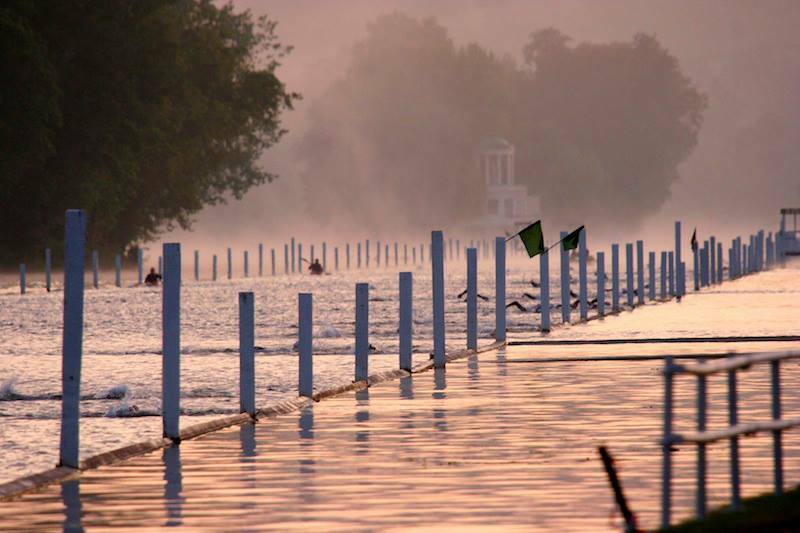 It is a 2.1km, sunrise, upstream swim along the Henley Regatta rowing course between the wooden booms. 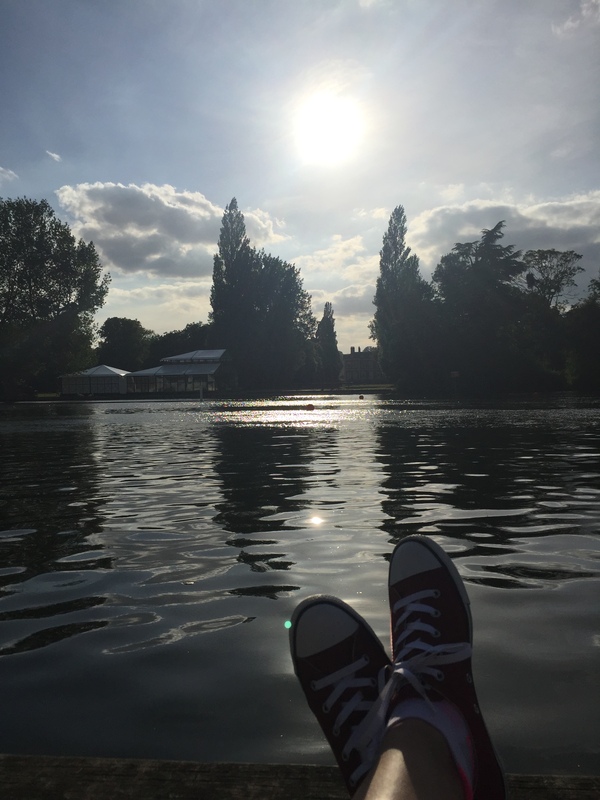 It was also my third Sunday in a row that my alarm has been set for 3am, the other two were Staffs 70.3 and a solstice sunrise swim in my local lake in the Cotswolds. 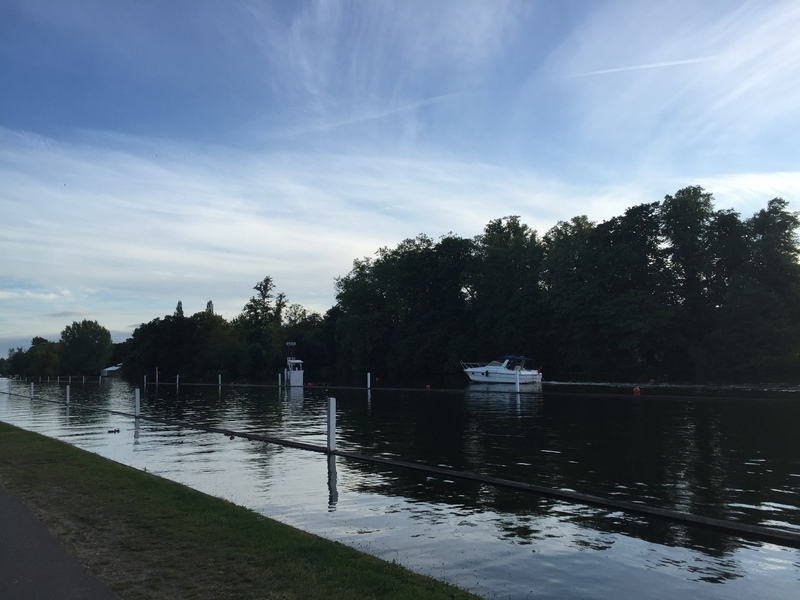 I drove to Henley on Thames on a sunny Saturday afternoon, due to traffic I ended up driving over the town bridge and around the centre which was memory lane trip from when I did my first HIM the last year of Challenge Henley. Bit of a Jobs worth on the campsite and parking gate who was totally thrown when I suggested I just set up my tent in the carpark as he wouldn’t tell me how to get into the campsite ! Minor irritation that soon subsided as I pitched my tent in the sunshine and could see the river and hear rowers been shouted at in training and other swimmers relaxing. 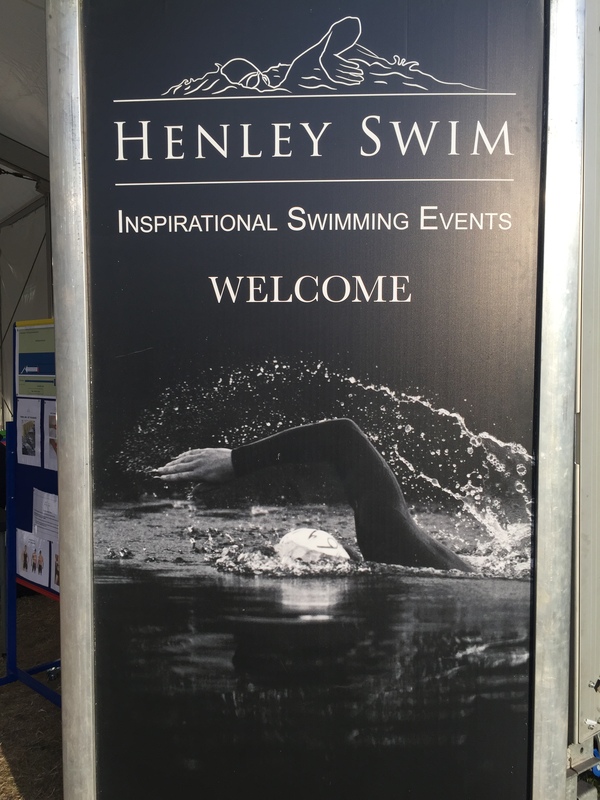 Walking down to registration I again recognised the Challenge Henley Half run course, no feed station banquets awaited me today instead pristine white picket fences marking off equally white and bright marquees all ready for the Regatta. The champagne bar wasn’t open for business but the Pimms tent was 🙂 Happy days. Ear plugs where are you ? If you know you snore and snore loudly please have the curtsy not to pitch your tent in the middle of the camp ground ! Apart from that a sound nights sleep until the 3am alarm. 3am and a 5 minute rain shower passed overhead so I wriggled into the wetsuit inside the 2 man tent. 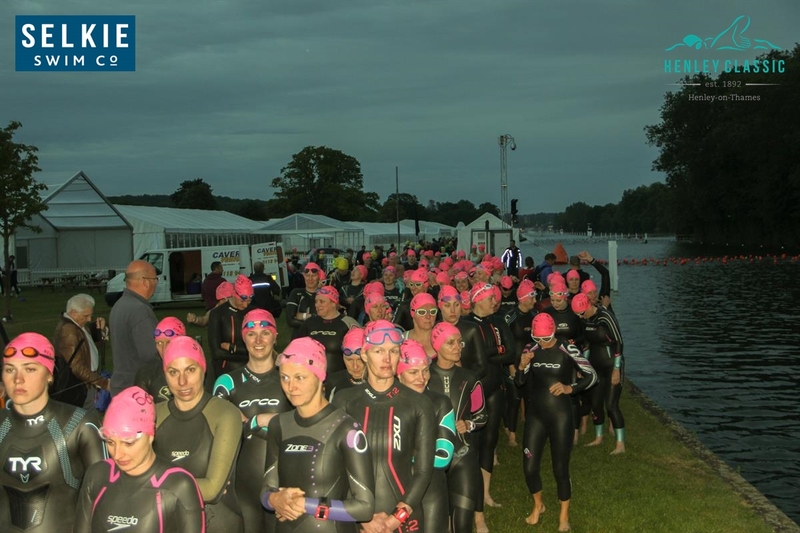 Then followed the wetsuit clad swimmers and head torches to the registration area. 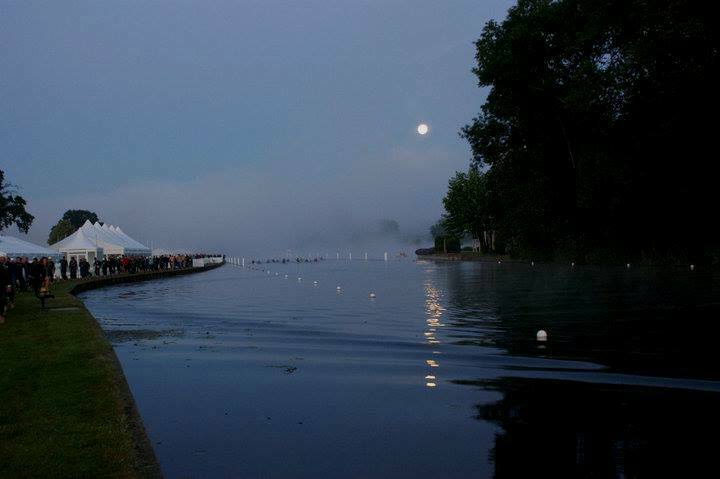 A countdown display was projected onto a marquee but the most stunning sight was the green laser light piercing the darkness that shone dead centre down the rowing course. The place was buzzing. Flaming torch bearers walked us down to the start area just beyond Temple Island, the rain was on and off and looked like fireflies darting through the laser light which caught the rain drops. Safety briefing and the rain had stopped, the first chinks of light appearing on the horizon. Official sunrise 4:48, my wave start was 4:50am. 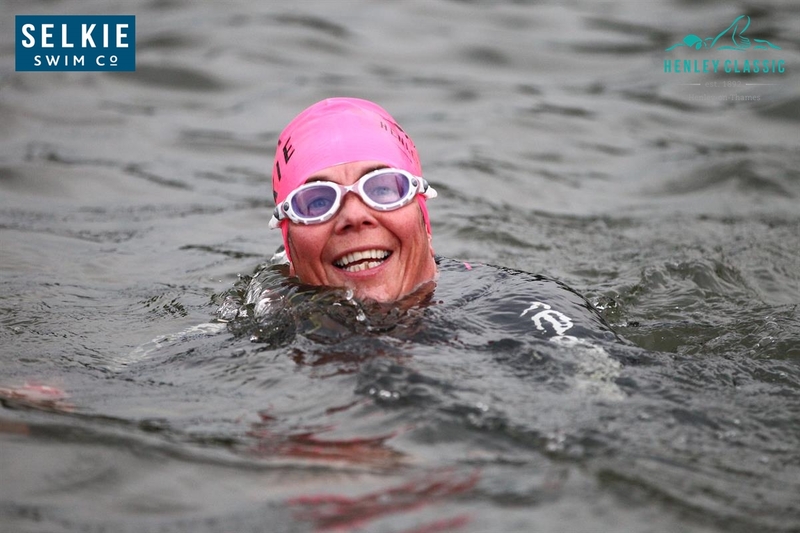 With another pink swim cap I lined up with a few other hundred ladies, most in wetsuits but a few doing it the traditional way – I will defiantly go none wetsuit next year. Water temp about 17c and the river was calm, until thousands of swimmers started splashing their way up stream to Henley town centre. Soon after the start the bumping and barging reduced as we all found clear water and our preferred swim line. I kept about 3 meters off the right hand boom which I could keep an eye on to make sure I went straight. Going around a back marker from previous wave knuckles did make contact with the solid wood boom and yes it hurt. 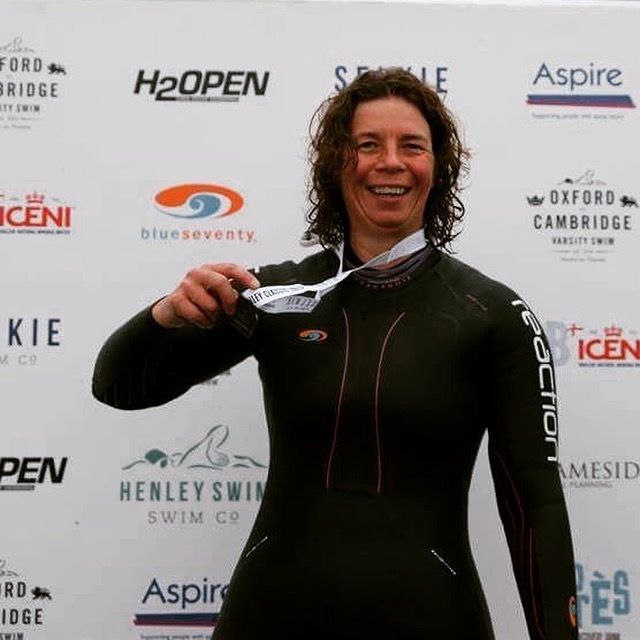 I seemed to have a dog walking along the path in line with me for most of the swim, I lost it at 500m to go. As the sun rose and we moved from dawn to daylight the distance markers came into view. I saw the steward box marking the rowing course end, then 100m past was our Finish arch to swim under, not forgetting to raise your hand and tap your chip. Smile for the photographer then climb up the steps. It seemed to over in a flash. Shoes and warm clothes for traditional swimmers had been shuttled from the start and in coloured plastic buckets matching swim cap colours so relatively easy to find flip flops. The recovery protein hot chocolate was very welcome even if I don’t like hot chocolate drinks. So much more chatter from swimmers walking back to the registration / expo area than pre start. No more nerves now, we had swum the course. More hot drinks available as well as hot breakfast foods. 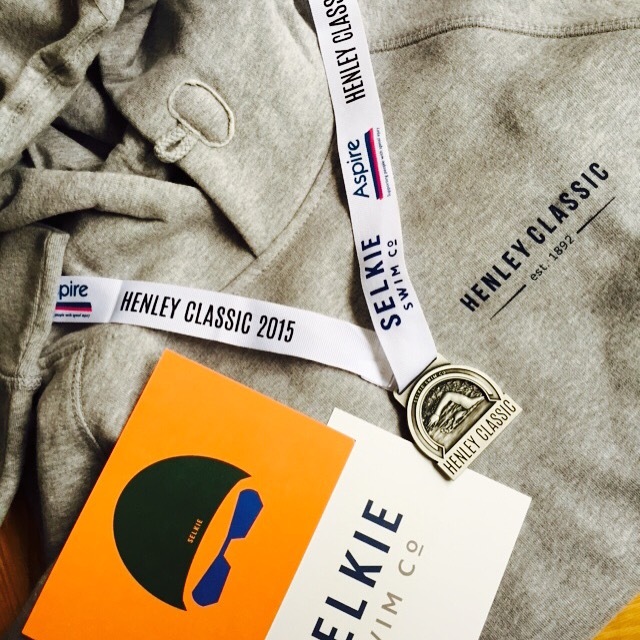 A finishers photo, cool medal and bag collect. I had time to go back to the campsite for shower and change before the awards presentation. There were some impressive fast fish out there with amazing times and the course record was broken. A swim cap draw added some fun at the end and I won a Selkies Hoodie, luckily I had my receipt in my purse from the one I bought and so was credited. Also your photos are free to download which is a nice touch. It was a very well run event, iconic, special location and the laser and sunrise made a fantastic atmosphere. Everyone was relaxed, chatty and all had a good time. I’d definitely book up to go back next year and will plan to go tradition in my swimsuit for a new challenge. 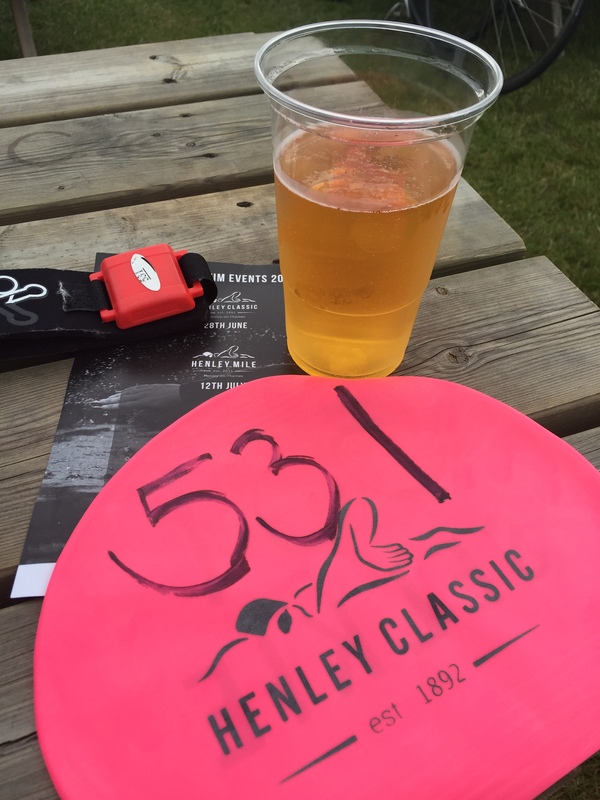 Henley Classic Swim took place on 28th June 2015, accurate measured upstream course 2.1km, 41:31 chip time. What was the visibility in the water like? Once the sun rose visibility wasn’t too bad Clear in the shallows. Best water quality test ever. The water visibility was pretty clear, best water quality test results ever. Improved as sun rose.